THE CENTRAL LIBRARY’S proposed demolition four decades ago inspired the Los Angeles Conservancy’s formation. 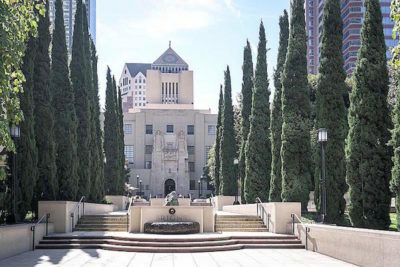 The Los Angeles Conservancy is not resting on its laurels but looking ahead — to the next 40 years — in a panel discussion Thurs., April 5 at the Los Angeles Central Library. It was the library’s proposed demolition four decades ago that inspired the Conservancy’s formation. The event, “The Future of Preservation in Los Angeles; the Next 40 Years,” takes place from 6 to 7:30 p.m. at the Mark Taper Auditorium at Central Library, 630 W. Fifth St.
Panelists include Margaret Bach, founding president, Los Angeles Conservancy, and Christopher Hawthorne, who will no longer be architecture critic at the “Los Angeles Times,” but will be in his first month as Mayor Garcetti’s first chief design officer. Larry Mantle, host of KPCC’s AirTalk and a fourth-generation Angeleno, will moderate. Issues addressed include density and housing and how preservation will play a role in the city’s future. Reservations are $20 for members; $25 for the general public. Visit laconservancy.org for more information.